just as one begins to think one's senses have had enough stimulation for one journey, one turns a corner in a sea of black desert, crests a dune, a few kilometres past the cairn erected to the memory of an Austrian tourist who perished after being bogged there just a few years ago, and there it is. Halligan's Bay, a vast expanse of nothing, or that's what it seems. It would normally be a mirage, but it's not, it's water in the lake, but it's very eerie. There is a breeze blowing, maybe five knots or more, yet as far as the horizon the water is so still that the sky reflects perfectly, there is no distinction between sky and water. The horizon one presumes lies somewhere between the clouds and their mirrored twins. There are seagulls. 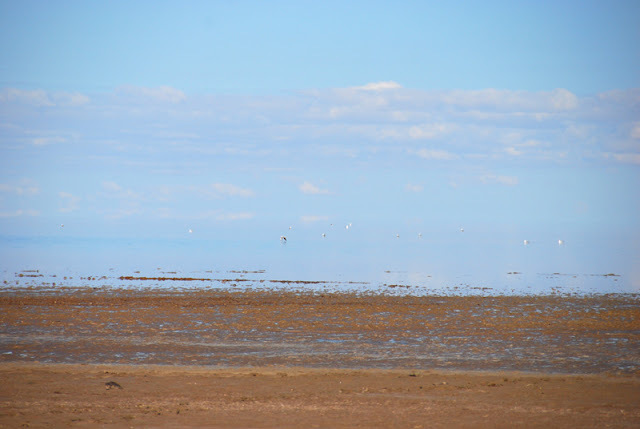 Seagulls for crying out loud, and the lake is so shallow they seem to be walking for kilometres. I'm glad we saw it. I'm really glad we didn't perish in the attempt.